2014 Mazda CX-5 Pros and Cons: Why (Not) This Car? After finding the redesigned 2013 Toyota RAV4 far more entertaining than I had expected it to be, a comparison with the Mazda CX-5 seemed mandatory. Among affordable compact crossovers, which is the most fun to drive? Also, the CX-5 received a larger engine for 2014. How much does the new 184-horsepower 2.5-liter improve performance compared to the 2013's 155-horsepower 2.0-liter? To answer both questions in a timely fashion, I borrowed a 2014 CX-5 Touring from a helpful Mazda dealer. My review of a 2013 Mazda CX-5 Grand Touring based on a week-long press fleet loan can be found here. Not posh, but clean and sporty. Why the 2014 Mazda CX-5? In a bid to broaden the appeal of its cars, Mazda added a focus on fuel economy to its traditional emphasis on handling. The 2013 CX-5 earned surprising EPA fuel economy ratings of 26 mpg city, 35 highway--but with a manual transmission and front-wheel-drive. Add AWD and a six-speed automatic transmission, and the ratings fell to a less lofty but still competitive 25/31. This, though, was with the wheezy 155-horsepower 2.0-liter engine. Certainly adding a half-liter of displacement (and 29 horsepower) must impact mpg. It does, but not much: fuel economy drops by a single mile per gallon, yielding 24/30. For those who'd like to trade the extra power for one mpg, the 2.0 continues to power the base "Sport" trim. I don't foresee many takers. The larger engine feels much stronger. At least as important, it doesn't sound nearly as weak and buzzy. But you won't find powertrain performance among the reasons to buy a CX-5 because the improvement merely makes the CX-5 competitive in this area. The CR-V and RAV4, among others, are about equally quick. Even with slightly lower EPA ratings the CX-5 still bests the 22/29 RAV4, especially in city/suburban driving. But there's a new segment champ. The 2014 Subaru Forester manages 24/32. While the Mazda CX-5 and Toyota RAV4 both put a high priority on handling, they feel very different. The RAV4's tuning is much firmer and tighter. It sounds and feels more raw. In comparison, the CX-5's steering and handling are much more subtle and nuanced. It flows through even bumpy curves, while the Toyota hunkers down and battles them. The RAV4's more overtly sporty character can make it more fun to drive, especially at first. But if you're willing and able to pay attention to what the Mazda is telling your ears, your fingertips, and the seat of your pants, over time it'll prove the more talented and more thoroughly engaging dance partner. It doesn't hurt that forward visibility is better in the Mazda, thanks to a lower, more compact instrument panel. The RAV4's driving position is good, but the CX-5's is nearly perfect as compact crossovers go. Rearward visibility? Not so good in either of them. It's probably not a coincidence that I discovered a similar difference in character between the Scion FR-S and Mazda MX-5 Miata. Base of windows rises steeply. Like some competitors, not easy to see out the back. The Mazda CX-5's chassis most impresses when considering handling and ride quality together. You hear and feel every bump and divot in the RAV4. The CX-5's more supple suspension does a far better job of taking the edge off the small stuff. While the CX-5's new engine is far from silent (and sounds better in the new Mazda6 sedan), at least it doesn't lightly drone the way the RAV4's does when you first tip into it or when cruising on the highway. The CX-5 might not sound or feel as upscale as the new Ford Escape, but it easily out-luxes the RAV4. While the Mazda CX-5's cabin isn't the most luxurious or most richly outfitted, it has much cleaner and more coherent styling than the Toyota RAV4's. The CX-5's controls are also easier to reach, as its center stack isn't shifted towards the passenger. From the side, the CX-5 and RAV4 have similar profiles. The Mazda looks a little sportier thanks to the surfacing along its lower body and rocker panels. The two compact crossovers differ far more when viewed from either end. The CX-5 has a large grille that overstates the potency of even the new, larger engine. But most people seem to vastly prefer it to the odd nose on the Toyota. Moving to the rear, the Mazda's appearance is again cleaner. Though an interesting detail, the RAV4's protruding tail lamps aren't to everyone's taste. Not that all is perfect with the exterior styling of the CX-5. Black wheel opening trim makes the Touring trim's 17-inch wheels appear far too small, especially when combined with the optional ($200) white paint on the tested car. Anyone who puts a high priority on exterior styling should avoid the white paint, and likely spring for larger wheels as well. The Grand Touring has 19s. For those not interested in spending the extra money for the top trim, the aftermarket offers solutions. Hopefully Mazda will wise up and fit the larger wheels to the mid-level Touring, as they have with the new Mazda6 sedan. 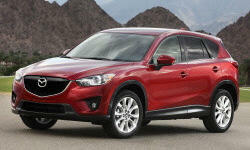 Why Not the 2014 Mazda CX-5? Mazda has been barely scraping by financially. And they have a hit with the CX-5. So perhaps they should be forgiven for bumping the price by $300 during the 2013 model year, then by another $420 for the 2014 and its larger engine. When introduced, the 2013 CX-5 Touring listed for $24,690. The 2014 lists for $25,410. These price increases let Toyota undercut the CX-5 with its pricing for the new RAV4. To get a sunroof, standard on the Toyota, it's necessary to add a $1,130 package to the Mazda Touring AWD, bringing its sticker to $27,790. The Toyota RAV4 XLE AWD checks in $1,255 lower, at $26,535. Adjusting for feature differences reduces the gap by only $100. Want nav? Then the gap before adjusting for feature differences widens to $1,710, but the adjustment cuts this in half. For those looking only at the price, the Toyota wins. But factor in the more refined look, sound, and feel of the Mazda, and most people will find its higher price easy to justify. There's no clear winner in rear seat room and comfort, either. The Mazda's rear seat is mounted a little lower than the Toyota's, and when sitting in it my knees are considerably closer (if still not close) to the front seat backs. Also, the Toyota's rear seat reclines, while the Mazda's does not. Neither car has air vents in the rear passenger compartment, but the RAV4 has a large vent high on the instrument panel apparently intended to push cool air into the rear seat via the ceiling. To counter these RAV4 advantages, the CX-5 offers about five inches more rear hip room. So three passengers will fit more comfortably. Big grille doesn't over-promise as much with the new engine. Wheels appear under-sized from every angle. The Mazda CX-5 only has about 90 percent as much cargo volume as the Toyota RAV4 (34.1 vs. 38.4 cubic feet with the seats up, 64.8 vs. 73.4 cubic feet with the seats folded), thanks to a slightly higher load floor and a more intrusive rear suspension. If you'll be carrying especially large objects, some that won't quite fit in the CX-5 will fit in the RAV4. Probably not a common issue. Neither vehicle's long-term reliability is known at this point. But Toyota has a stronger record. My main concern with the CX-5 is that it might be prone to rust like older Mazdas. But the same wheel opening trim that makes the wheels look small should also help prevent rust. Around 2019 we'll find out. With this, I'm all out of reasons not to buy a Mazda CX-5. The main weakness of the 2013 Mazda CX-5, not enough engine, has been fixed with the 2014, and without a substantial hit to fuel economy. Toyota has priced the new RAV4 aggressively, and it is surprisingly fun to drive. But the CX-5, while a little more expensive and not as overtly sporty, seems a better all-around car, even a better driver's car. While the Toyota might be more fun for the first hour, the Mazda's broader talents and greater refinement render it a better partner for the long haul (especially if rust stays away). Extra half-liter for 2014 makes performance competitive, only one mpg sacrificed. Seats fold nearly flat. About ten percent less cargo volume than in a RAV4 or CR-V. Suburban Mazda of Farmington Hills provided the car. They can be reached at 877-290-8110. 2014 Mazda CX-5 pros and cons, according to Michael Karesh: the best reasons for buying (or not buying) the 2014 Mazda CX-5. Join TrueDelta to post your own impressions.